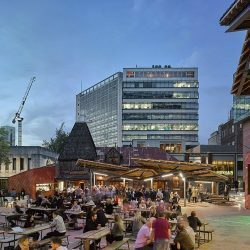 In Summer 2018, on behalf of The Casey Group, R&B undertook the timber construction of bars, serveries and a dedicated stage area at the newly refurbished Oast House venue in Spinningfields in the centre of Manchester. We also provided the full electrical fit-out including designer external lighting and pop-up power solutions. Bedroom refurbishment project at the Fleece Inn in Howarth, West Yorkshire. R&B Building Services provide all aspects of refurbishment and renovation works including mechanical and electrical services.